Though they are inherently theatrical spaces, churches aren’t always the best places in which to mount a play. The acting space is limited, the acoustics designed for choral worship and the sightlines are restrictive. The location, however, in this case is fabulous. 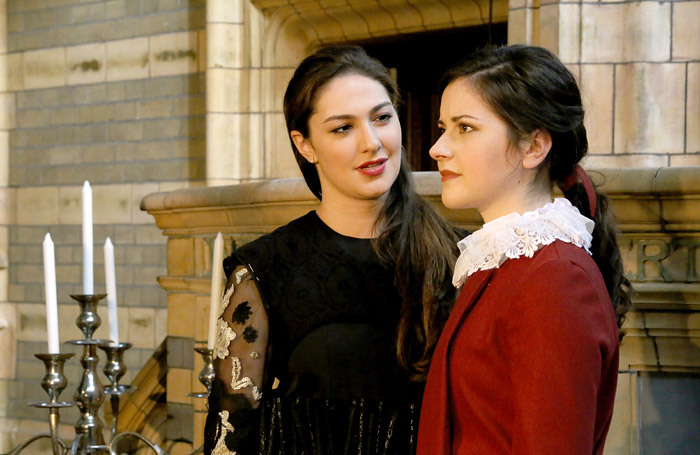 Scena Mundi’s Twelfth Night takes place at the French Protestant Church in the heart of Soho, an area of reinvention, revelry, cross-dressing and fashion. These are all themes that feed into Shakespeare’s comedy although Cecilia Dorland’s timid production only lightly touches upon them, opting instead for an ostensibly formal interpretation. Set designer Edward Fisher’s attempt to tame the majestic austerity of the venue requires greater imagination or presumably a bigger budget as do Georgia Green’s costumes, which hint at a haute couture/Elizabethan fusion but lack such adventure. The small cast negotiate the text with gusto and the broader elements of the comedy are easily the more successful. Thomas Winsor’s eye-rolling Sir Andrew forms an acceptable double-act with Jack Christie’s gregarious Sir Toby, while the mercurial Martin Prest’s pompous Malvolio picks out the mood of the play implicitly. The quieter moments invariably suffer, and the interplay between Pip Brignall’s boyish Orsino and Harriet Hare’s clearly feminine Cesario, are lost almost completely.